Yeah, yeah, yeah. In my original review, I said I was done trying these things. 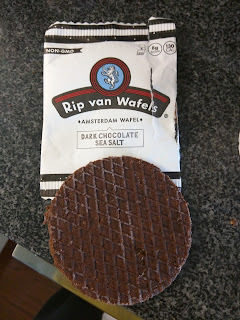 But ... they expanded the product line to not just include the 'traditional' stroopwafel I had before, but they now have one with a coconut filling, a more wholesome one with oats and honey, and, something a bit more up my alley: chocolate. So, I tried again. Oops. "Bold dark chocolate with a hint of salt." I wanted to tell you all about this. But ... it went exactly the same was as attempt #1 before. I placed it over my cup as instructed, turned my head for about 2 minutes, and ... then it was gone. Doh. Collapsed into my coffee. I can't tell you anything about this product. 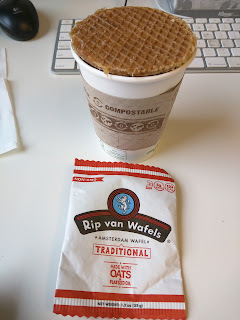 What I can tell you is that coffee, with little disintegrated bits of wafel floating in it, is really not very good. 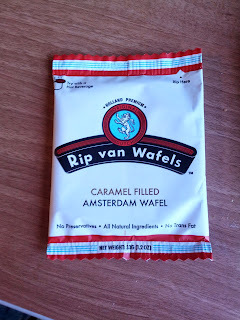 Yesterday I reviewed real waffles, so today, for "snack foods Friday", I turn to packaged "wafels" instead, by Rip van Wafels. Rip van Wafels is a local San Francisco business, sold at many coffee shops around town, but the treats are Amsterdam style, designed to just be consumed with your drink. Unfortunately, due to user error on my part, which you'll read about below, I didn't actually get to enjoy one of these. Whoops! The packaging has clear instructions. 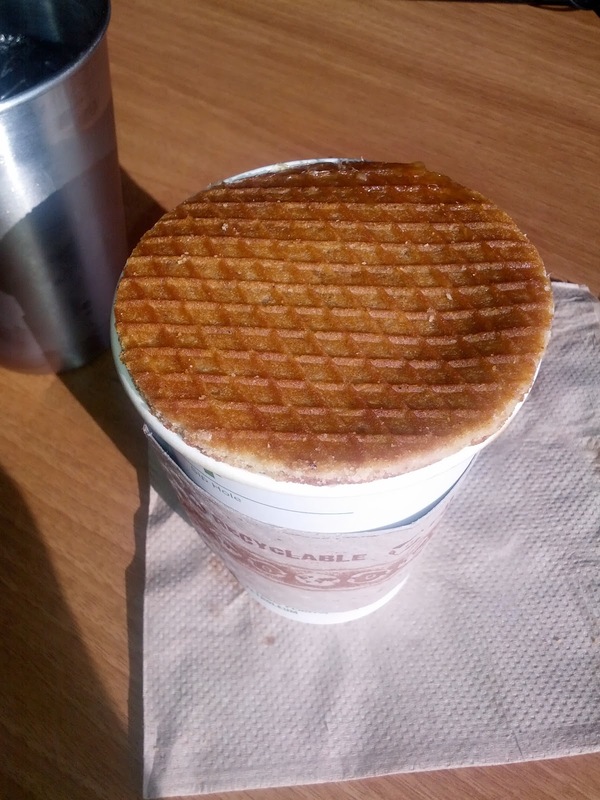 You are to take your wafel-cookie, place it on top of your coffee/tea/hot chocolate/hot cider/etc, and wait. Patiently. And wait some more. They sorta insist that you wait. They promise it will be worth it, while the caramel inside melts due to the steam from your warm drink. 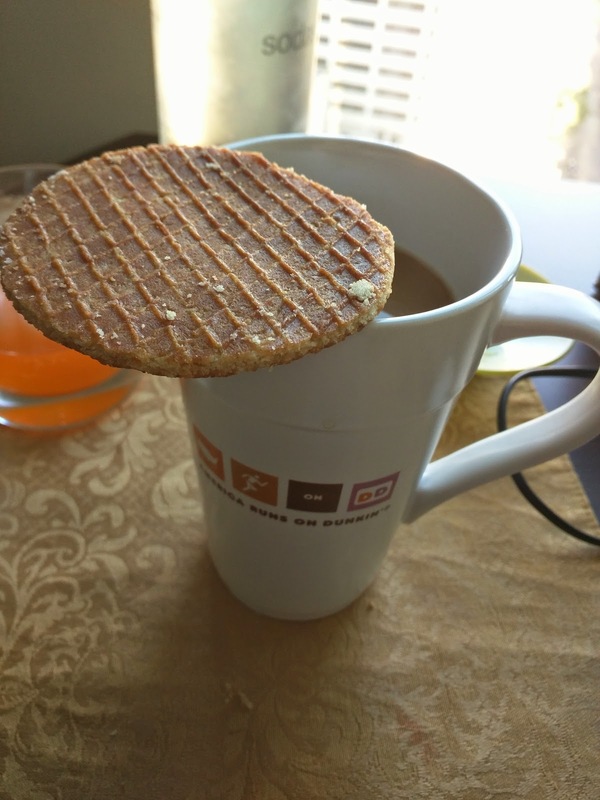 Perfectly sized to fit on top of cup. Well, please, I am me, so of course first I had a tiny bite. The cookie part reminded me of a sugar cone from a Drumstick, a bit soggy-like. Hmm. So I waited, as instructed. While I waited, I went to read the web site to learn more about the product. I also saw that I could dip it if I preferred. So, I eagerly turned to my cup to try dipping it. 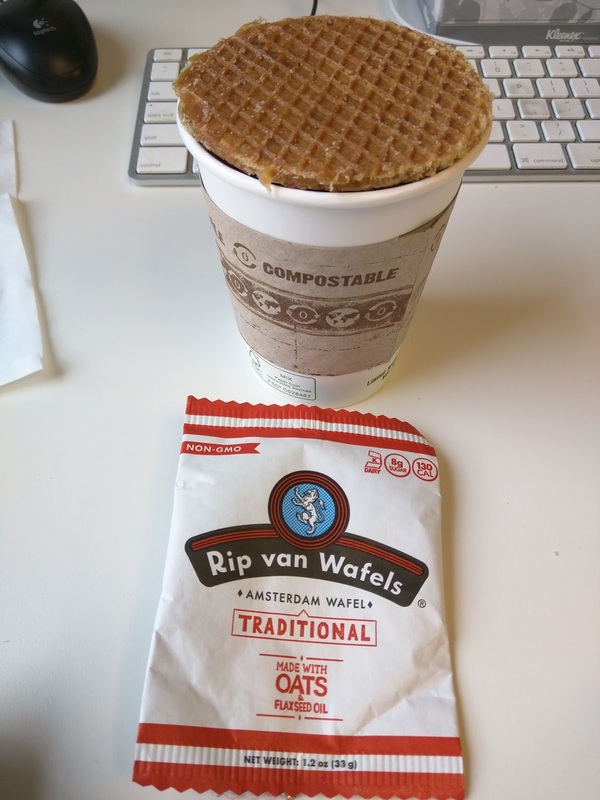 And ... my stroopwafel wasn't there. Wat? Did I move it? I looked around frantically. No, I swear, I left it on top of my cup. Then it dawned on me. It fell in! I must have waited too long, so it got too limp, and collapsed into the cup. I fished it out, hopeful that it was salvageable, but it was a lost cause. Just a soggy mess. Curiosity got the better of me, so I tried another. This time I perched it on the edge, just like in the pitcher, rather than fully covering the top of the cup. And I waited. And waited. It never really got soft. I mean, it got a bit softer, but certainly not as I expected given the description that the caramel was supposed to get soft and melty inside. I waited longer. Now my coffee was just getting cold. Grumpy cat. Since I didn't really like it when it was just at this temperature, I ended up mostly dunking it into the coffee instead, sorta like it was biscotti. This was ... ok, but really not great. I gave it another valiant effort. Went back to a coffee cup where it fit perfectly. And waited. It never really got soft. The caramel never got gooey. My coffee got cold. Even dunked in my coffee I didn't care for it. As you may recall from my review last year, Palomino is the restaurant located, literally, in the same building I work in. It doesn't get more convenient than this, right? Yet, as I said last time, I never go. Why? The food is just not good. The cocktails are not good. The service is not good. There is no reason to ever go here. Go ahead and read my previous review for full details. Except I recently did, two nights in a row. Just like last year, my work group had a large event hosted there, so, I went, both nights. I tried to give Palomino another, chance I really did. But all my comments from last time are still true. The cocktails were all awful. The staff acted like they'd never hosted a large event before, again, no serving utensils, nothing labelled, running out of plates and forks, etc. Such a mess. A couple of the appetizers were passable, and I found one that I really did like, but that is not enough to draw me back in. Palomino has a large speciality cocktail menu. Many options sounded great, but they were all totally unbalanced. Over the course of two nights, I tried a number of drinks, but could barely find any that I wanted to finish, let alone order another of. 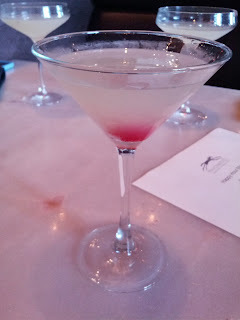 The "Candied Apple Drop" was strangely bitter, not "candied" and sweet as expected. 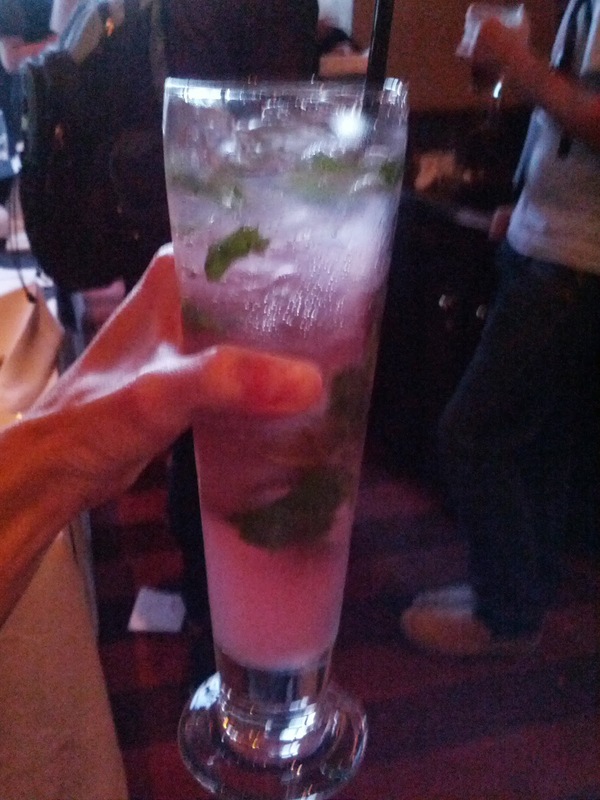 The Cranberry Mojito tasted like rubbing alcohol. 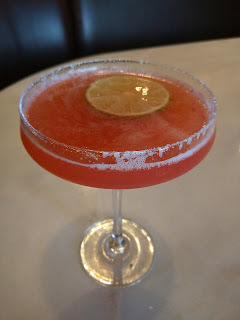 The Pomegrante Margarita was mediocre, but not as offensive as some of the others. I don't remember all the drinks I tried, but I assure you, none were worth getting. "Grey Goose Vodka, Strawberry Puree, Prosecco Float." 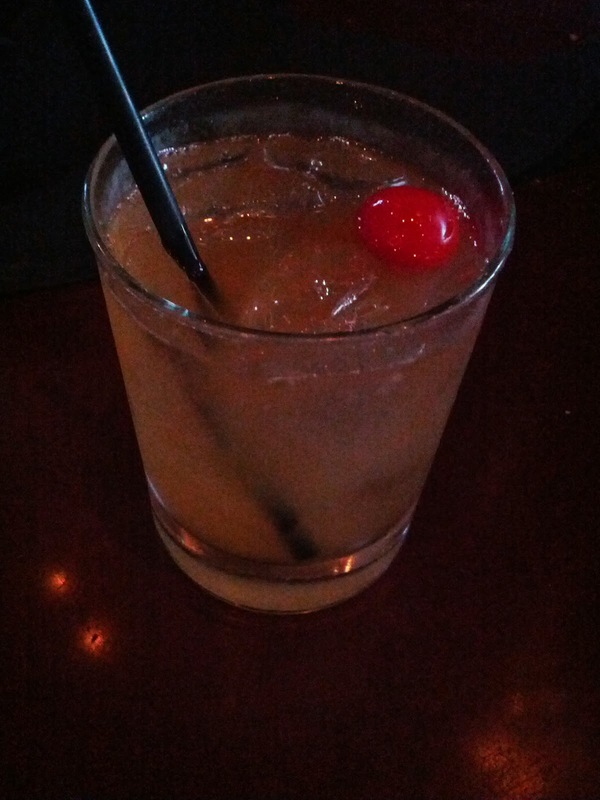 This drink was very unbalanced. Crazy sweet, way too much strawberry puree. Not good at all. I couldn't finish it, even when I tried to water it down. 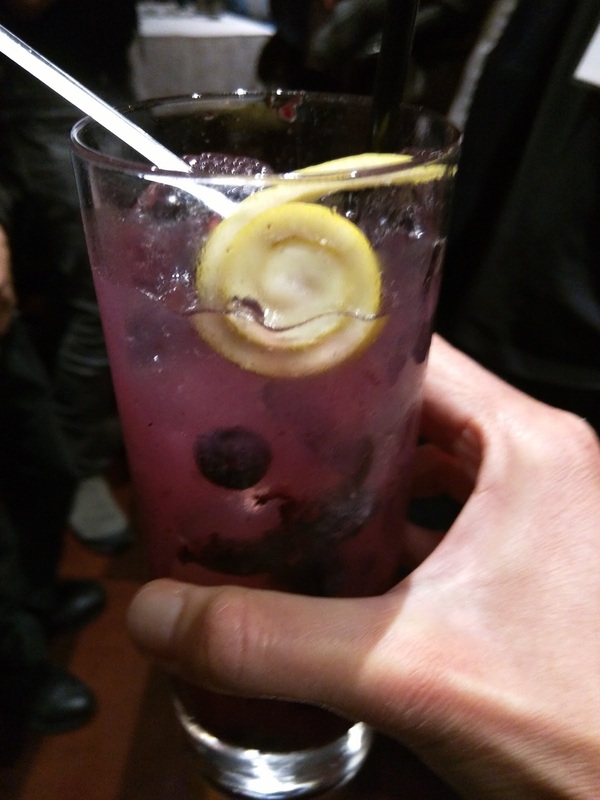 "Stoli Blueberi Vodka, Blueberries, Fresh Sweet & Sour." This actually wasn't a bad drink. Lots of muddled blueberries, cute swirl lemon peel garnish, almost balanced between sweetness, acidity, and alcohol. I wouldn't get it again, but I did at least finish it. Also, they didn't really have small plates or utensils with which to eat the food. They set out a handful of small plates and forks, but they ran out immediately (the forks almost all went into the serving dishes), and they never replenished anything. I don't understand, as they hold large events all the time. Aren't these basics? Also, nothing is ever labelled, so even simple things like figuring out what is vegetarian was impossible. Anyway, our hosts pre-ordered an assortment of apps and pizzas, none particularly interesting. I skipped a few, like the hummus and flatbread, and the bruschetta. I tried everything else though. Like last year, the apps were indeed the highlight. "Fresh Herbs, EVOO, Herbed Mascarpone." I actually really enjoyed this. 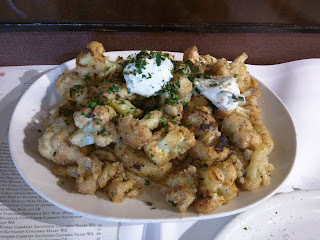 The cauliflower was nicely cooked, roasted yet still soft. Underneath it all was a cauliflower puree, flavorful, tasty. I loved dredging it in the herbed mascarpone that melted into the cauliflower. I went back for more and more of this, both nights. This was, hands down, the best thing I've ever had at Palomino, and the only thing I really would consider ordering myself. "Hot Chiles, Smoked Pepper Aioli, Marinara, Fresh Squeezed Lemon." On my previous visit, the calamari was the only decent dish. It was again just that: decent. Not rubbery, nicely fried, crispy, and I really liked the spicy jalapeño bits. The marinara was incredibly lackluster, but the aioli wasn't bad. Overall fine, but not worth going out of your way for. Our hosts ordered a ton of pizzas for the group. I recalled that last time I didn't like the pizza, but it looked really good, so I dug in again. Wrong move. The pizza always looks much, much better than it is. The best was the Prosciutto Crudo, with a decently flavorful basil pesto, fresh housemade mozzarella, and a soft egg in the center. But still not good pizza, by any stretch of the imagination. The pizza just tastes like nothing. Thin crust, boring sauce, boring cheese. You know me, I'm not complete with dessert, and the crazy sweet drinks didn't count. So we got permission to order dessert, even though not normally part of the large group experience. At the urging one of the servers, we ordered tons of the donuts for the group. The donuts are normally served with 7 donuts and a small bowl of mascarpone and whipped Nutella on a plate, but they just made massive portions for us. Ours came on two platters, one with the mascarpone, one with Nutella. 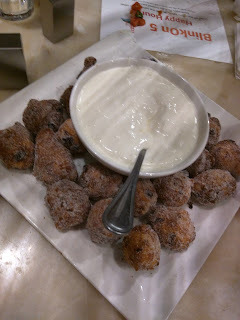 The donuts were fried balls, sorta like donut holes, but crispier. Hot and fresh. They do seem to do a decent job of frying things here (donuts, calamari). Not too oily. But not particularly exciting either. The donuts were rolled in cinnamon and sugar, and plenty of it. I liked that aspect. I did enjoy the mascarpone, but, I love mascarpone in general (see cauliflower above). Overall these were fine, but not really worth ordering again. I didn't even go for a second one. Everyone else went nuts over the Nutella, but, really, it was just Nutella, no different from any other. Palomino is the restaurant and bar located in the same building as my office, which just happens to be across the street from my house. You'd think that in the years of living and/or working here, that I would have actually gone there. There really is not a more convenient place to get food, or even a drink. They are even open on Sundays, a rarity in this neighborhood. And they serve brunch. Yet .. the place has somehow never struck me as worth setting foot inside of. Palomino is actually part of a small chain, and the restaurants are described as "Urban Italian", "famous" for their hardwood fired Mediterranean cooking. I think that means pizza. I still haven't been for a normal meal, but I did attend an event hosted there. It was obviously picked for the location, since we were coming from a conference right upstairs. We had the back area reserved to be somewhat private. The tables were all removed, so the area was open, save a few tables that were set up for buffet style food, as the host arranged for assorted appetizers and pizzas, along with a few specific cocktails that we could choose from. I can't comment on the regular restaurant, and I usually don't like to review a place just based on catering or special event experience, but I doubt I'll be returning. So, take this all with the knowledge that it was large, special event, and may not be indicative of their standard offerings. The appetizers were actually fine, but the pizzas were not very good, nor were the cocktails. But where everything really fell apart was with the way they handled the large group catering. They laid food out randomly, without any signs or labels of what anything was. Some items came out as only one batch, consisting of say 10 pieces, for our group of 160+. All the food came right as the event started, and was never replenished, even though we had the space for several hours. Maybe this was the fault of the organizer on our end, who just made a strange order? There were also no serving utensils provided for many of the dishes, even though it was buffet style. And, no forks for us to eat with. 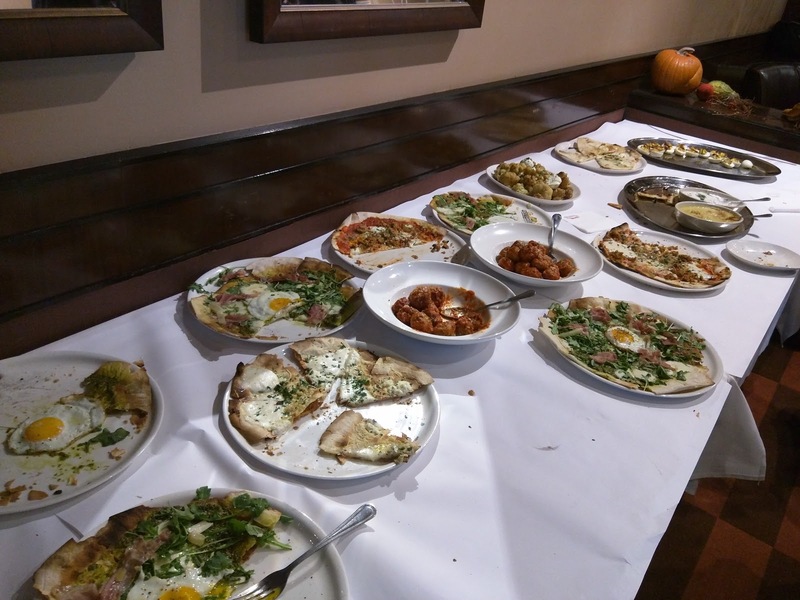 The placement of the dishes seemed totally random, with dips on one table, without anything to dip in them, and the bread that was supposed to be used with them just off on another table. It was really just a mess. I certainly would not recommend hosting an event there. Candied Apple Drop. $5 HH. I started with the very tasty sounding Candied Apple Drop. Unfortunately, there wasn't anything remotely candied, nor apple, about it. It had no distinguishable flavor and was highly unremarkable. The only thing I liked was the cherry in the bottom. $5 for a cocktail at Happy Hour is a fine price, but I certainly wouldn't it this again. 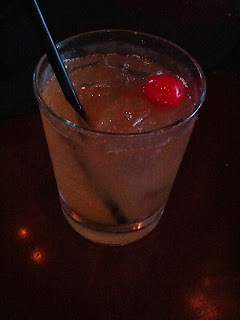 I moved on to a more classic drink, a Whiskey Sour, hoping they would do it justice. It was very unbalanced, acidic, and way too bitter. Again, price was fine, but the drink was worse than the previous, and I didn't even bother finishing it. I actually ordered a pomegranate martini, but received a cranberry mojito instead. Turns out, I was quite happy with the error. This was the best drink of the night, by far. It was refreshing, yet fruity, minty, very balanced. I really enjoyed this, and would get another. $5 price was again great. 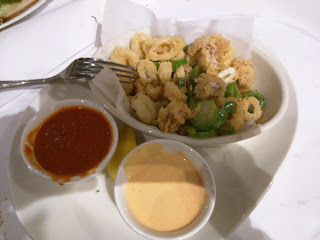 Crisp Calamari with Smoked Pepper Aioli and Marinara Sauce. $9.95 HH, $13 regular. Tomato Basil Bruschetta. $5.95 HH, $9 regular. The first appetizer set out was tomato basil bruschetta, with "herb oil, roma tomatoes, pesto, fresh basil". I did not try it in the first few minutes since I wanted to see what else was coming, and when I looped back to get a slice, it was long gone. They never brought out more of it. 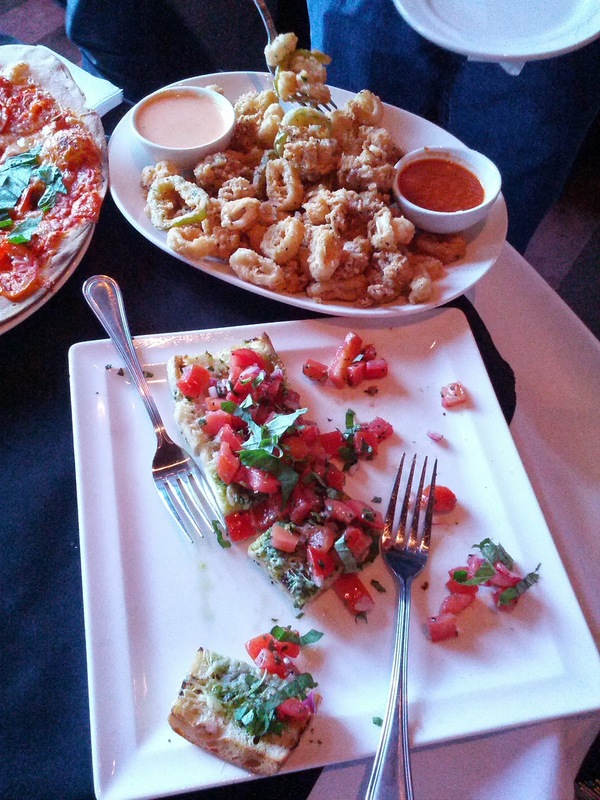 Soon after the bruschetta arrived, a couple platters of calamari were set out. There were no serving utensils provided, but we were able to find a few forks. Most people still just grabbed them with their fingers, touching numerous other pieces, and would then dip them in the sauces, usually getting their grubby fingers in the sauce. I was fairly grossed out by this. But anyway. 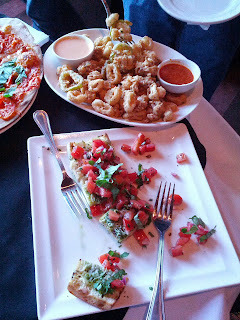 The calamari was described as coming with "hot chiles, smoked pepper aioli, marinara, fresh squeezed lemon". It was decent calamari, delivered fresh out of the fryer, nice and crispy. It had just the right amount of batter, not too heavy, but enough for crunch. The calamari were mostly rings, not chewy. There were also some battered pepper rings, that I wouldn't have known were supposed to be "hot chiles" if I didn't read the description. Served with two dipping sauces, neither of which were remarkable. The marinara tasted like it was from a jar. The aioli wasn't really creamy, and certainly didn't taste of smoked pepper. Besides the sauces, this was better than I expected. I would have had more, but like the bruschetta, after this initial offering, no more was ever brought out, and I'd only taken a few pieces so I could sample everything else first. Both dishes were $3.05 cheaper at Happy Hour than on the normal menu, which doesn't really make sense to me, since one dish was $13 normally, and the other $9, so it was a totally different percentage of the original costs. Prices were about what I'd expect. 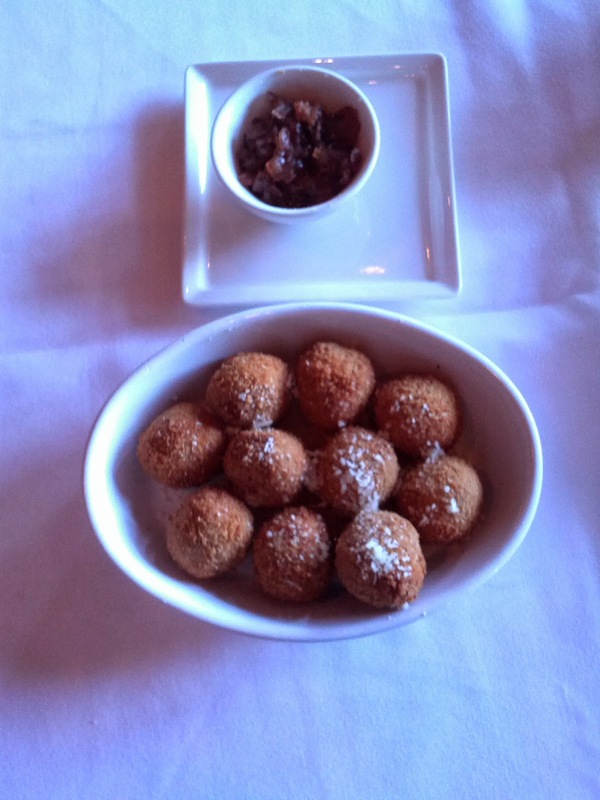 Curried Chickpea Fritters, Onion Jam Gastrique, $5.95 HH, $6 regular. Next they brought out a single order of the chickpea fritters. A party for 160 people, and only 10 fritters? That was really strange. Anyway, since nothing was labelled, I had no idea what these were. I could tell they were fried balls, and they had some parmesan cheese on top, and had what looked like an onion jam beside them, so I thought they might be filled with cheese or something. 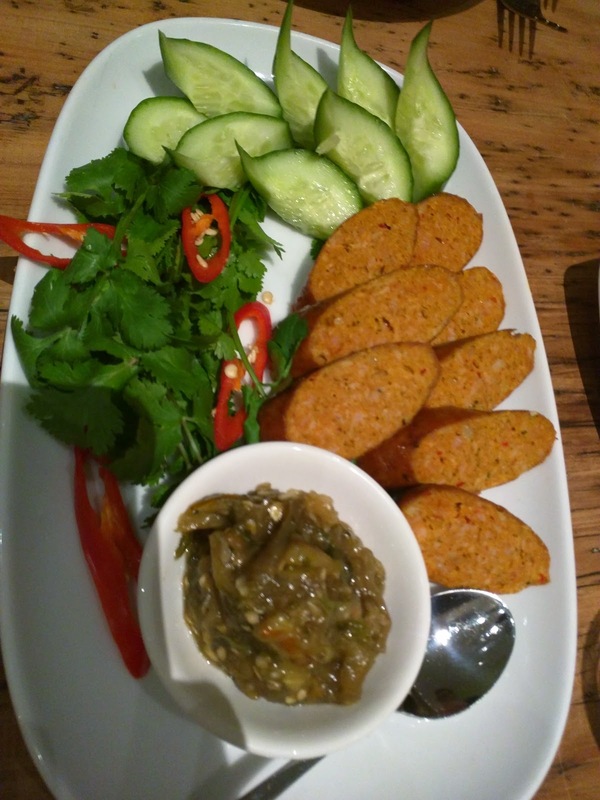 It turned out that they were "chickpea fritters", which I'm still not really sure how they are different from falafel. They were fried balls of chickpea. The crust was nice on them, but I don't really like chickpeas, so I didn't really enjoy them. Cheese sprinkled on falafel is also a bit strange. The onion jam was flavorful, but again, there were no serving utensils, and it was thick and these weren't really dipable. Amusingly, the regular and Happy Hour prices on these were only $0.05 different. What? French Onion Dip. $5.95 HH, $6.50 regular. Next came some dips. Again, none were labelled, so it was a bit interesting trying to guess what they all were. At least this one came with a spoon (although, subsequent batches would not). They also did bring several batches of this out throughout the night. 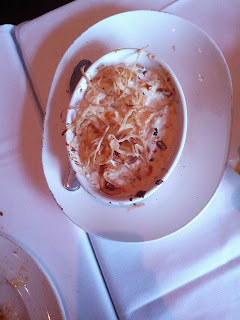 This was apparently the "French Onion Dip", although it did not resemble any onion dip I've ever had before. Rather than sour cream, it used cream cheese for the base. And had pancetta bits in it (sorry vegetarians, I'm guessing you thought the onion dip was safe?) For the onion components, there were caramelized onions in the dip, and fried onion strings on top. Served with "brick-oven flatbread crisps" on the side, which, more often then not, were set out on different tables than the dip. I wish I had photos of the flatbreads, as they were ridiculous. They were slathered in butter, just dripping. Yes, the idea is to coat super buttery bread with sour cream, pancetta, and fried onion rings? Yikes. No worry, as they didn't actually put the bread out anywhere near the dips anyway, so people ended up just dipping their pizza crusts in it, or eating it by the spoonful. But back to the flatbreads. They were completely burnt. At one point, someone asked me, not jokingly, where I found dessert. I was confused, and he said, "aren't you eating a brownie?" Yes, the flatbread was sooo charred that it looked like a brownie. And the dip looked liked cream cheese frosting. Speaking of the dip though, it was tasty enough. It came out very hot, and held temperature well. It also tasted good cold later on. By far my favorite of the dishes, although I'm still not sure I'd actually order it myself. It was very, very creamy, and really had way too much cream cheese and too little anything else, but ... the onion flavor was good, and I really did enjoy the crispy onion strings on top. The little pancetta bits added additional smokiness and salt. Again, an amusing Happy Hour vs regular price difference, this time of $0.55. This seemed like a really good price for a dish this size. Crab and Artichoke Dip. 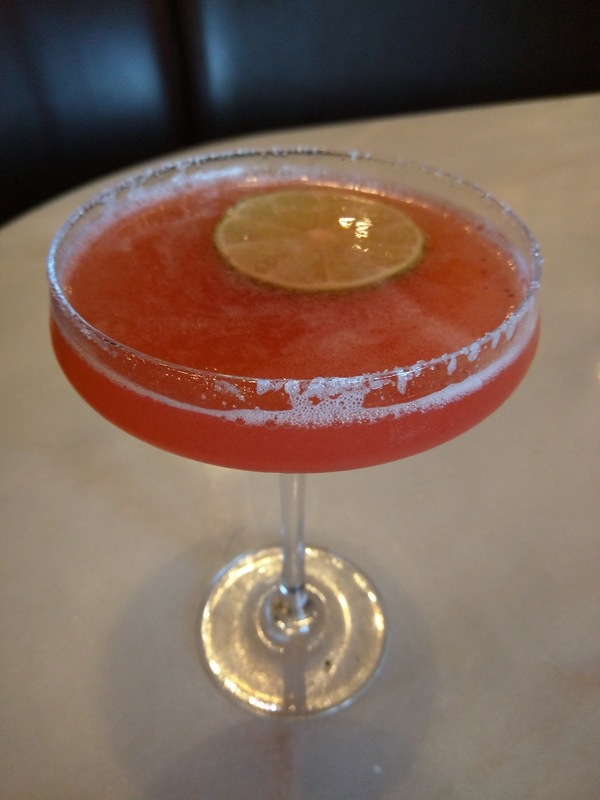 $9.95 HH, $15 regular. Along with the onion dip, another hot dip was set out. 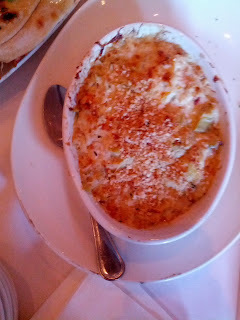 I'm glad I'm not vegetarian, as I could have easily thought this was just a cheesy artichoke dip at first glance. But, it was crab and artichoke, which I realized the moment I took a bite. Well, I didn't realize it was crab, but it tasted really fishy. In a not good way. Like, in a very bad old seafood way. It was topped with breadcrumbs. Like the onion dip, it came out hot, and several more were brought out throughout the night. And like the onion dip, the flatbreads it was supposed to come with were no where to be found. And, this was the only batch that came with a spoon. I didn't care, as I stayed far away from it the rest of the night after that initial very bad bite. Moroccan Hummus & Tzatziki with Grilled Pita $5. The final dips were a cold duo: hummus and tzatziki. We were given a single order of this. No spoons. And the pita? On a different table. Seriously, what did they expect people to do with it? The pita was much better than the flatbread that came with the hot dips. It was nicely grilled, not burnt. It wasn't drenched in butter. But neither dip had any real flavor to it. I wonder if they would have been good with the falafel, er, chickpea fritters. And finally, pizza. Palomino has a large pizza menu, and I think is their biggest seller. Described as "featuring our hand-pulled fresh mozzarella and the freshest ingredients on a crisp brick-oven charred crust". We received tons of pizzas. While I was grumpy about mostly just getting a single batch of most of the apps, the pizzas did keep replenishing. We received all 3 of the Happy Hour special pizzas. Fresh Roma & Mozzarella Pizza. $7.95. I started with the simple roma and mozzarella. 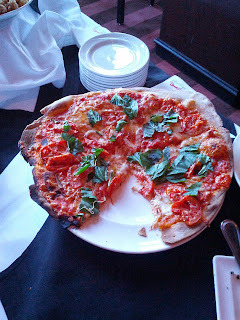 As promised, it was indeed served on a "brick-oven charred crust". The crust was super thin, super crispy. I think a bit too charred, but no where near as bad as the flatbreads. Plus, I know that is trendy these days. The red sauce was totally unremarkable, just like the marinara for the calamari. It could have been any generic canned brand, and it was spread too heavy for my taste. The cheese was equally unremarkable, certainly didn't seem "hand-pulled" or fresh, but I'll take their word for it. I thought there was too much of that too. The tomato slices were soggy and didn't seem properly ripe. I appreciated the large torn chunks of basil. 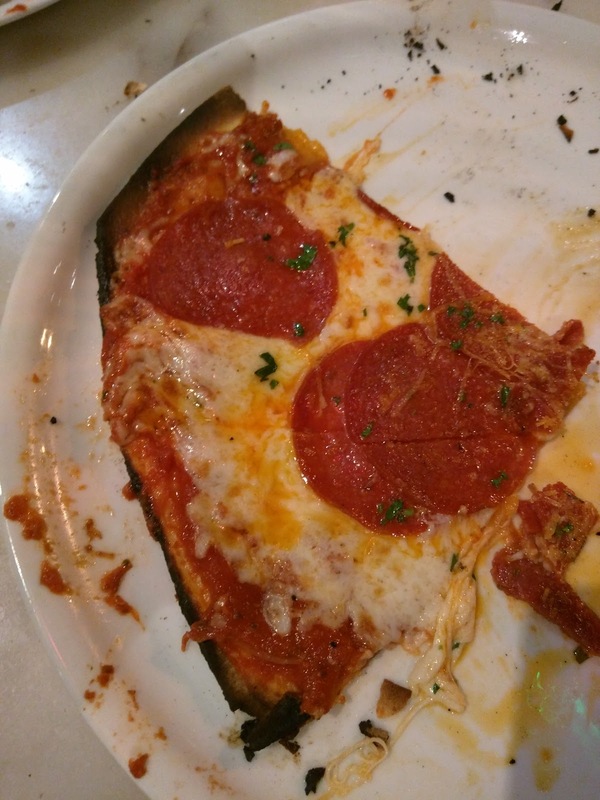 In fact, the pizza LOOKED really good, it just didn't really taste like much of anything. Only offered on the Happy Hour menu, $7.95 price seemed fine. 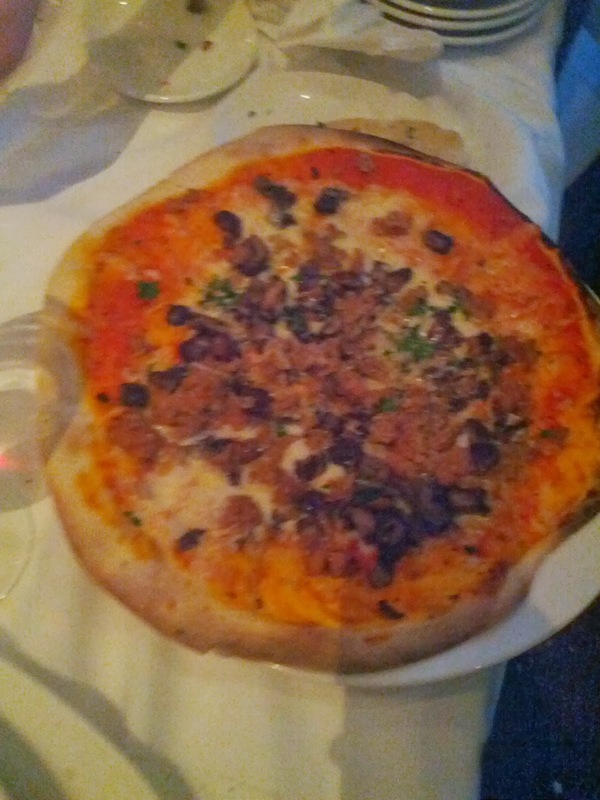 Hot Italian Sausage & Mushroom Pizza. $8.95. I moved on to the next pizza, one that is far my more style anyway, sausage and mushroom. The crust was about the same, thin and crispy, and this one was less charred. The sauce and cheese were again unremarkable. The sausage was ground, and the mushrooms were cut into tiny chunks. There was a good amount of toppings, and I love the mushroom and sausage combo, but again, this pizza just didn't taste like anything. $1 more than the basic pizza, seemed fine for the generous toppings. I didn't get a photo since my phono battery died, but they also had a pepperoni, with large slices of pepperoni. I didn't try it, but it was Ojan's favorite of the dishes. You may recall that on my last visit to Sydney, my favorite thai adventures took place at Sailor's Thai, both the casual Canteen and the formal Restaurant. When making plans this time around, a co-worker had one request only: he wanted to go to Sailor's Thai. I looked at the website out of curiosity, just to see if there were any new menu additions or changes, and was very confused. Why was there only one menu now, rather than one for the Canteen, and one for the restaurant? And why did it seem to be a hybrid of the two previous menus? I asked the restaurant and was told that they have changed their concept, serving a new menu format, in both locations. Hmm. I wonder if their business wasn't going well? Anyway, this made it easy to decide where to go. If the menu was the same, we'd go to the restaurant, since we had a group of six, and the Canteen doesn't take reservations. I was amused by the fact that for all dishes that remained on the menu from before, the Thai names were replaced with English equivalents, aka, gone was "ka nom hua lan" and in its place was "caramelized coconut dumplings". I guess the thai names were too hard for people? As for our visit ... not so successful. The food was poorly executed and the service was horrible. It was incredibly awkward throughout. The server came to take our drink order within seconds of us sitting down, but after that, I had to flag him down to order anything. Our water ran out and was never refilled. Our wine glasses went empty and no offer of more wine was made. Dishes we ordered to share were brought without any share plates or even cutlery for the individuals, let alone for serving. Getting the bill took absolutely forever. We had to flag someone down to ask for it, but even once we had it, getting someone to come take the credit card was actually incredibly difficult, and again, took physically getting up from our seats to get attention. They never looked our way again after delivering the bill. I didn't take a photo, but I had a glass of chablis, since I remembered liking the one I had last time. It was again a tiny pour. It was warm. It was clearly not the same wine, and had an awful acidic finish. Since the server ignored us the rest of the meal, I wasn't ever able to order something different. I think Sailor's Thai may have gone the way of Bill's for me. It remains a great Sydney memory, but, I'm not eager to return. When we visited the Canteen before, the menu had only three choices for starters, all very simple, including the spring rolls that we didn't like, plus chicken satay and curry puffs. The Restaurant had both "appetizers" and "starters" on the menu, all far more complex, like the intricate flower shaped dumplings, that we also sadly didn't really like. Now the merged menu has 7 starters, all somewhere in-between the simple offerings from the Canteen and the fancier offerings from the restaurant, including scaled back versions of the crispy vermicelli noodles, betel leafs (now with prawn instead of salmon), and grilled scallops. The dumplings and pineapple bites that we got last time are gone, as are all of the selections from the "starters" menu. 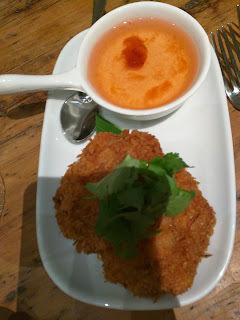 Starter: Prawn cakes w/ plum sauce. $10. The restaurant had fish cakes on the menu before, but now offers up a cheaper alternative: prawn cakes. You can tell they are trying to arrive at a menu that is not only a hybrid in terms of the presentation style, but also the price. The cakes were crispy and hot, clearly freshly fried, but incredibly oily. They didn't seemed to have been drained at all. Inside the cakes was big chunks of prawn plus a lot of filler that I couldn't identify. The sauce on the side was light and sweet, and actually tasty, but, I wanted something more like an aioli to go along with the fried food. The $10 price was reasonable for the portion. Starter: Chiang mai pork sausage w/ green chili relish. $20. One diner wanted the sausage. Not something I'd normally pick, but, I do like sausage from time to time, so I wasn't opposed. The sausage was served a room temperature rather than hot. It had a really bitter skin. I didn't like it. On the side was a huge pile of cilantro. What were we supposed to do with that? And slices of cucumber, which were refreshing and a nice compliment the heat from other components. The heat I speak of came from the green chili relish, which was really quite spicy. I actually really liked it and found it quite flavorful. I ate it by the spoonful at one point, since I didn't really have anything else to add it to. My least favorite dish, and it seemed pricey for $20. The main dish menu is broken into Salads, "From the Grill", "Stir Fries", and "Curries". We got at least one from each category. For the new menu, none of the mains from the restaurant remained, I guess they were all deemed too fancy, so most of the menu for mains came directly from the Canteen, plus a few new additions. Dishes were delivered as they were ready, which was appreciated since they were hot and fresh, but it was a bit strange to get our salad so late into the meal. I guess I'm used to salads as more of a starter, and less of a main? We also ordered rice, which is served per person. We had six people, and I didn't want rice, so I ordered rice for five. When our first dish came, the server also had a big bowl of steaming rice, and he then proceeded to walk around serving it to each person. This made no sense to me. Why not leave it on the table? Once he scooped out a little bit for each person, he left with it, so when our later dishes arrived, we couldn't pair them with rice. No further offer of more rice was made. I wonder if we could have asked for more? Of course, that would have required someone noticing us. It was also annoying because it took him a long time to serve each person, and our precious first dish got cold while we waited. Grumble. "in a sticky sweet and sour sauce." 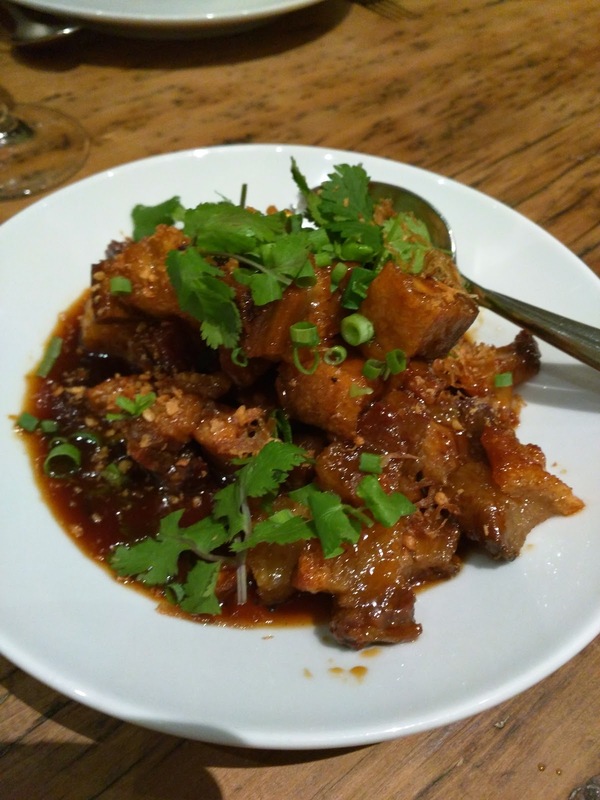 We started with a selection from the "Stir Fries" section, the crispy pork belly. It was the dish I was most excited for. On our last visit to the Canteen it was my hands down favorite. I adored the sweet sauce and the perfectly chewy crispy pork. This time it was ... fine. The sauce was ok, but not as sticky, nor as sweet, as I remembered. The pork belly didn't seem as well prepared; the edges were super chewy, almost too chewy, and the interior was just fat that didn't render out. I don't know enough about cooking to understand this, but it seems like it wasn't done at the right temperature? This was quite the disappointment. I found that I didn't even want to bother soaking up the sauce, which, last time, I ended up dipping anything I could find into the sauce to get more of it. Still, my second favorite dish of the night, which, might give you an idea the direction this review is going. "Marinated wagyu beef served with a tamarind and chilli sauce." This was our selection "From the Grill" (the other option was spatchcock). I would normally just skip the grill section, since for me Thai cuisine is all about the spicing in the sauces and curries, but, one diner wanted this. The beef was fine, obviously decent quality, nicely grilled, but certainly cooked well done. We weren't given an option, perhaps we could have asked for it less cooked? It seems like such a shame to cook wagyu well done. It was served with a huge chunk of cabbage on the side. 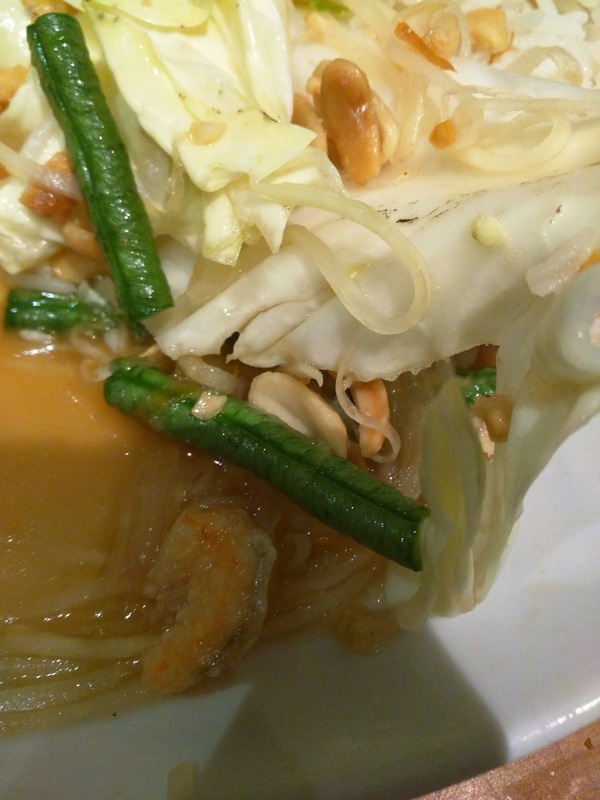 It sounds silly, but I adore the cabbage at Sailor's Thai (normally with the papaya salad, more on that below). It is always so fresh and crispy, and the perfect compliment to cleanse the palette and tone down the heat from the spicy dishes. As you might expect, I did actually really like the tamarind and chilli sauce, and dunked my cabbage in it. Eventually I just ate it by the spoonful. I have no shame. It had excellent flavor. Neither Ojan nor I would get this again, but I did enjoy the sauce. The portion wasn't huge, but the $29 price didn't seem too high for quality wagyu. 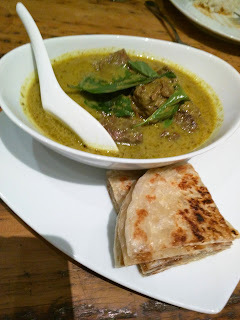 Green curry of slow cooked wagyu beef w/ roti. $29. Next, moving on to a curry selection, we opted for the green curry. Other options were red curry of chicken or jungle curry of barramundi. I don't really care for green curry, but I wanted this dish for one reason: the roti! Last time, I fell in love with the roti. I ate more than half of it. We even managed to order a second serving of just the roti, even though it is not on the menu, because we loved it that much. This time, the roti wasn't very good. It wasn't hot. It wasn't crispy. It was just thin and greasy. Meh. I slathered it in sauces, and even then, I didn't want it. I was a bit heartbroken, since I really loved it so much on my previous visit. The curry sauce was ok, but, as I said last time, not really my thing. 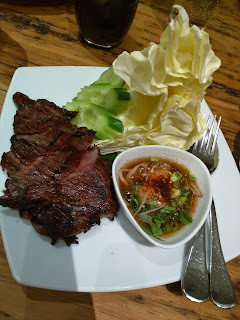 The beef was really tender and flaked apart easily, and this was Ojan's favorite dish of the night, and he said he'd still return to Sailor's Thai for this. "Green papaya salad with peanuts, dried shrimp, spicy & sour dressing and sweet pork." 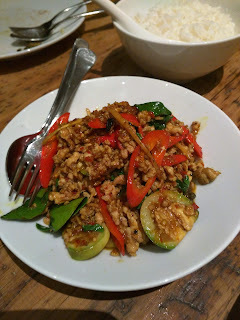 This was the only dish that still had its Thai name. Guess papaya salad is just that well known. It came from the salad portion of the menu, one of three choices, and always our number one order from Sailor's Thai Canteen. 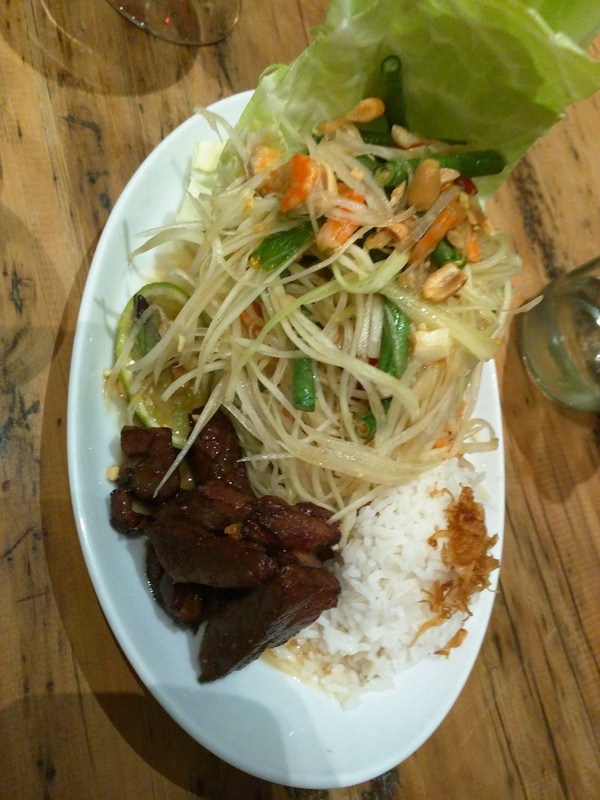 It was this dish that made us become repeat customers in the first place, so I was glad that it remained on the merged menu (the banana blossom salad from the restaurant also remains). And while I say it was weird to get our salad at this point in the meal, as you can tell, like always, this is not a skimpy little salad. Served on one side was a bit of steamed rice with crispy bits on top. I don't really eat rice so I could care less about this, but it did nicely soak up all the juices from the salad. The salad is served atop a huge chunk of cabbage that Ojan used to always devour. The first time I saw him do this, I made fun of him, until I realized how awesome it was. The papaya salad has so much heat that you need something refreshing to cool your mouth. The cabbage is crispy, fresh, and delicious. And if you can handle the spice, the layer that gets soaked in the salad dressing is my absolute favorite. And then ... the magic. On the side is the sweet pork. Pork candy. Sweet chunks of chewy, delicious pork. I absolutely adore this stuff. On our last visit, I wasn't quite as great previous visits, but, I did love it again this time. It just has the perfect level of chew and sweetness to it. So good. Honestly, I could do without the papaya salad, and just take the candy pork. Speaking of the papaya salad itself. The execution wasn't great, which seemed to be the theme of the meal. The base was standard shredded green papaya, and that was fine. The green beans weren't properly cooked, too crispy, and not in a good way. Bits of peanut are bits of peanut, unremarkable. But ... take a look at the little shrimp here. They were gross looking, with really, really visible poop tracks. Now, cleaning little shrimps is rare, but these looked particularly bad. I had a few of the nicer looking ones, but they tasted really fishy, really old, really off putting. The description says they were dried, but, they really didn't seem it. Either way, they were really quite nasty. And, look at the cabbage. See the black on there? While I loved the cabbage, it didn't seem washed. There was a lot of dirt and grit on it. The sauce was good though, great flavor from the fish sauce, and spicy enough. The bits of pork from this salad were my favorite bites of the evening, but the rest of it I could do without. "With chilli, garlic, lemongrass and wild ginger." Our final selection was another from the Stir Fries section, ordered by one of my fellow dinners. It is not a dish I would normally order, since I don't like chicken. I was full, so I didn't bother try it. It was only about half finished, which could have been because it came last, or because it just wasn't great. I didn't get a good read off my fellow diners to find out. The $26 price tag seemed pretty high for a chicken dish. The Canteen never really had much of a dessert menu, just coconut ice cream and sorbet of the day. The new merged menu kept these, and kept just one dessert from the restaurant menu. "in pandanus pastry with cream." I didn't care for these last time, and I didn't want the ice cream or sorbet, but others seemed a bit unsatisfied and wanted dessert, so we got it. No drink menu was provided at dessert time, otherwise I'm sure some after dinner drinks would have been ordered, perhaps some dessert wines or tea/coffee. We probably could have specifically asked, but, we were pretty defeated at this point, and just didn't bother. 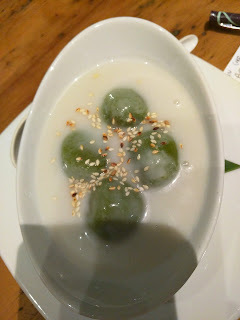 I also didn't bother try a dumpling, since I knew I didn't like them before, even when the rest of the meal was better. Everyone else split them in half. No one liked them. No one wanted the final one, and it went unfinished. Even me, the girl who loves dessert, and hates for food to go waste, still didn't bother. The dumplings took a long time to arrive, so I think they were freshly made, since they were served warm. I lapped up the coconut cream, but even that wasn't good Seriously, how do you make coconut cream not taste awesome? I certainly wouldn't get this again. Starbucks is known for many things, but quality pastries, even after the La Boulange integration, is not really it. Yet, as you may recall from my earlier review, I'm strangely fascinated by them. I know they aren't high quality. I know they arrive at Starbucks frozen. But ... I enjoy the scones, even though they leave me feeling totally gross. So, I gambled, and tried another item. I moved out of the comfort zone of scones, past the quickbreads and cake pops I never liked, and zeroed in on the croissant style items. Regular croissants, chocolate croissants, morning buns, and cheese danishes were my options. And honestly, they all looked awful. Flat as pancakes, not flaky. But for some reason, I still went for it. And, just the scones, I'm glad I did. I don't get it. It didn't remotely live up to the description of a “flaky pastry”, as the dough wasn’t remotely flaky nor laminated nor layered, but, it wasn’t awful. If you think of it more like a donut, it works. It had that slight cloying oiliness about a donut that makes your gut hurt a little just thinking about it, but it wasn’t too bad. And as long as you didn’t expect light, flaky croissant dough, it wasn’t offensive. Although, it was flat as a pancake. The cheese filling was creamy, generous, and moist. Overall, truly not awful. I got it to bring home, so at first I had it cold, so I can’t comment on how it transforms warmed up by their magic machine. Then I moved it to my own toaster oven, again, not a true reflection of how it would come served at Starbucks. My toasting wasn't a great move - the top got crispy, perhaps a bit flaky, but not really. The filling got creamier, which was nice, but, overall, it was the wrong move, and I actually liked it more cold. I know Starbucks isn't novel to anyone. I'm sure you've been there. Most likely however, it has been for the drinks, which I've reviewed before. Perhaps for a frappuccino, which I've also reviewed before. Or, maybe for one of their famous seasonal offerings, which I've also reviewed. But have you been to Starbucks for ... the food? Yes, Starbucks isn't known for their food, but when they purchased La Boulange a while ago, they revamped all of the food offerings, trying to turn more into a "bakery". Except, you know, a bakery where all the baked goods are mass produced in off-site baking centers and shipped to the stores. When they first introduced the items to stores, they required that you have them warmed up. You can read all about the reasons why ... but I don't recommend it if you ever want to eat any of these things. Anyway, you know I've never really been impressed with the La Boulange bakeries themselves, nor their breakfast catering, so what chance did I have to like the even more mass produced items? Little chance for sure, but you know me, curiosity finally got the best of me. I can't resist baked goods. 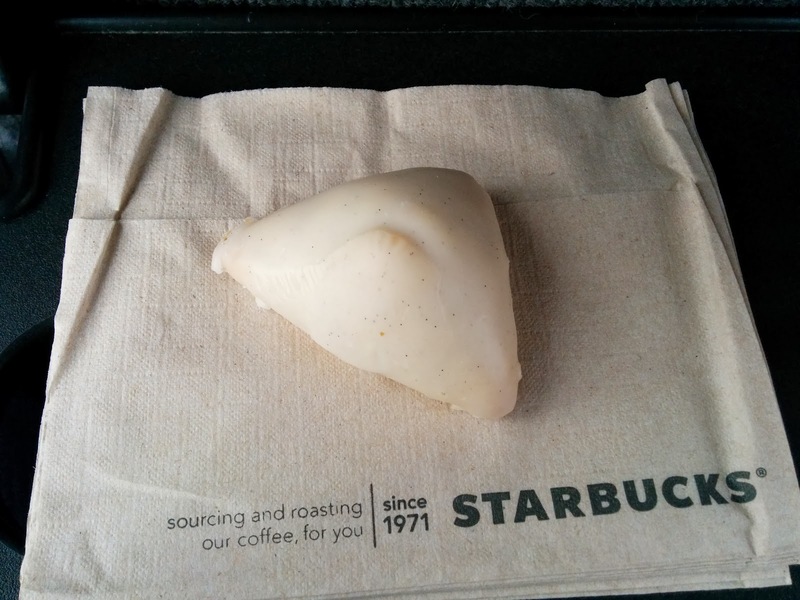 Starbucks now carries only three scones, two are regular size creations from the new La Boulange line, but the tiny little vanilla scones still remain from their original lineup. I have of course tried, and compared, all three. "Our moist, fluffy petite scone is made with real vanilla beans and natural vanilla extract. It's a bite-sized treat that’s big on flavor." Back when I commuted regularly, I rode a shuttle from the Civic Center Muni station. On the very rare days that I wasn't frantically dashing to catch my bus, I'd hit up to Starbucks to grab a coffee, and sometimes, a treat. I always went for the cute little petit vanilla scones. I remember really liking them. I recently ventured into Starbucks and wanted something sweet to accompany my drink. I saw that even though most of the baked goods had been replaced by the La Boulange offerings, the petit vanilla scones remained untouched. Yes! Described as, "a moist, bite-sized scone flavored with natural vanilla extract and real vanilla beans." The scone looked exactly the same as I remembered, and I see no indication online that the recipe has changed at all, but ... I didn't like it. Maybe I changed. First, it wasn't really a scone. It was strangely soft and fluffy. A scone shouldn't be a brick obviously, but it also shouldn't be a cake. The flavor of the cake itself was completely boring. 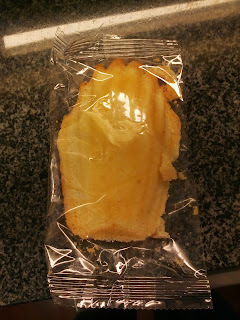 It did have visible little black flecks, which I guess were vanilla bean, but I didn't taste vanilla. At least it wasn't burnt? On top was vanilla icing, very sweet. Too sweet. This scone offered nothing, other than its reasonable $0.95 price. I sorta wish I hadn't tried it, and let it stay in my memory as the great treat it once was. La Boulange Blueberry Scone. $2.45. "A traditional scone with blueberries, buttermilk and lemon." After the disappointing vanilla scone, I decided to try one of the updated scones from La Boulange. 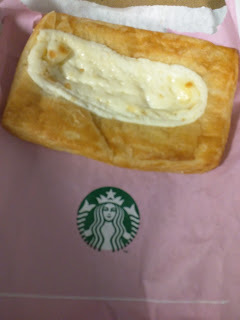 This was an interesting choice on my part, since I haven't really liked any baked goods from the real La Boulange bakeries, so why would I like the less fresh ones at Starbucks? Answer: I really was craving a scone. I also forgot that they heat up all of the La Boulange offerings, without asking. I was planning to get it to go, and eat it later, but once it was warm, I had to try it right then. I was amazed when I opened the bag, as the aroma coming out of it was pure blueberry. It was incredible. Because it was heated up, it was really moist, and not hard, like a scone normally is. This threw me off a bit at first, it seemed far more like a cake or muffin than a scone really. But once I tasted it, I stopped caring about the fact that it wasn't really a "scone". While I didn't taste the lemon that was supposed to be there, the buttermilk was fantastic. It had such a great tang to it. The blueberries were fairly plump and moist, and added a lot of flavor, however, they weren't very well distributed throughout the scone, and many bites did not have any. But the buttermilk really made it a winner. I also appreciated the large sugar crystals on top for additional sweetness and crunch. It was also well cooked, not burnt anywhere. What would have made this really amazing would be some jam to spread on it. One thing I always really appreciate at La Boulange is that they have housemade jams available at the condiment station to jazz up any of their offerings. I can't imagine Starbucks incorporating this into their stores, but it really would work well with this scone. $2.45 was a pretty standard price for a scone, and it was a large size. I liked this far more than I ever expected to, and would actually get another. 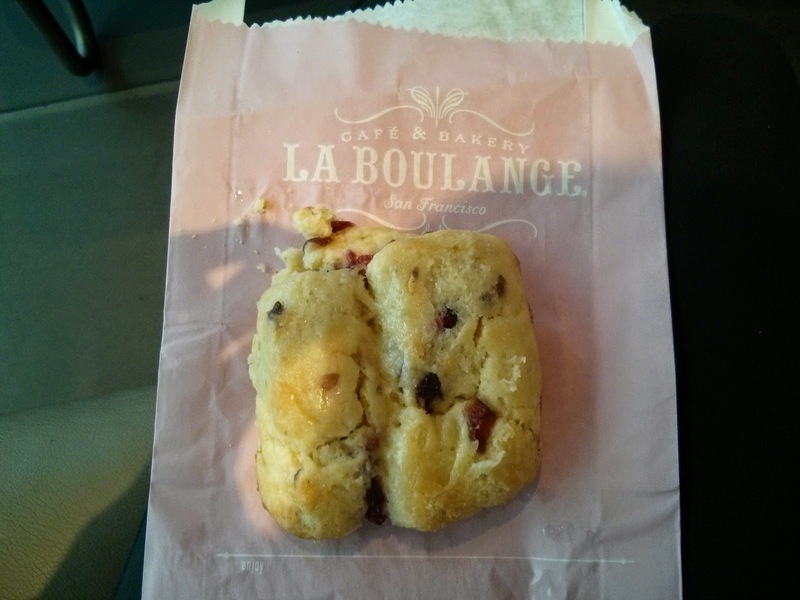 La Boulange Cranberry Orange Scone. $2.45. "A traditional scone with cranberries, orange zest and cranberry spread." 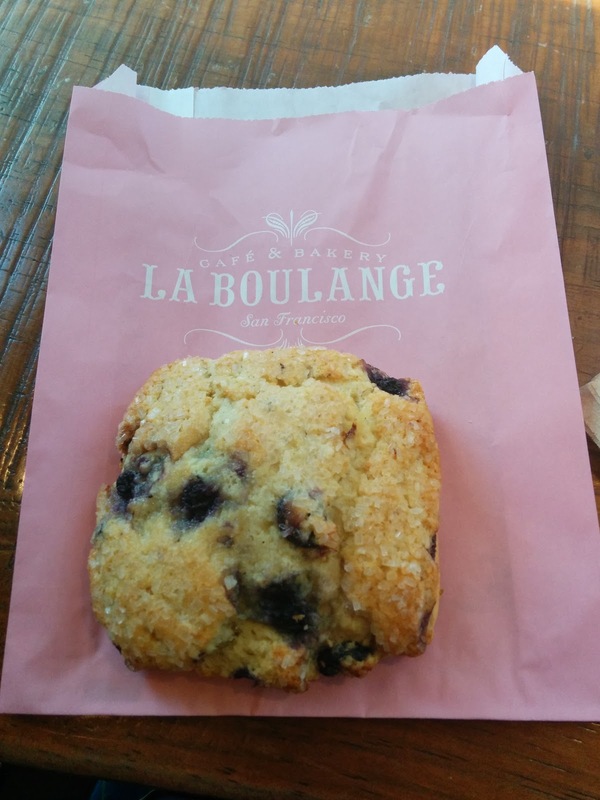 After the shocking success of the blueberry scone, on my next visit, I decided to branch out and try the other variety of La Boulange scone: cranberry orange. In the case, it looked hard and not very appetizing, but, the blueberry one surprised me before, so I still tried this one. This time, I was asked if I'd like it warmed up, and since I was planning to consume it right there I said yes. Starbucks really has worked some magic with their heating machines, as it was handed over to me in what seemed like only 30 seconds, totally nice and warm. It was also totally and completely gross, but in an almost ok sort of way. Let me attempt to explain this one. Since it was warmed up, it was very moist and doughy. The center was almost raw even. How was this possible, when moments earlier it was a solid lump? It was loaded up with cranberries, which were very tart. I'm not really sure why I even thought I'd like this, since I don't like tart cranberries. Mine didn't seem to have any of the cranberry spread in the description or photos from Starbucks, which I think is for the best, since I wasn't loving the cranberry. It did also have a touch of orange to it, again, not something I really like, so I'm not sure why I choose this. The scone was consistently cooked, no burnt or dried out edges, but the base flavor was quite boring. No tang like the blueberry one. It did have nice large sugar crystals on top for some crunch. This thing was really quite fascinating. 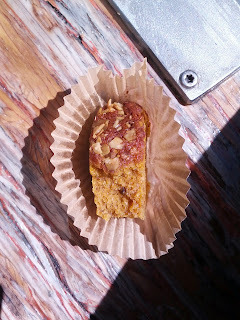 The bottom and the sides were quite boring, not very flavorful, and kinda cakey, not at all what I think of as a scone. The whole thing seemed not fresh and loaded with preservatives. 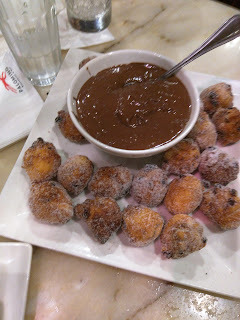 But that gooey inside was actually really addicting, even though it was sorta like raw muffin batter. I devoured it. And then, I felt ridiculously sick afterwards. I can't say for sure it was the scone, but ... it sure seems like it. I won't be getting another, gooey center or not! Besides the scones, the rest of the La Boulange baked goods at Starbucks look really unappealing. The muffins always look soggy. The croissants and danishes look worse than what you see in a generic grocery store. The rest of the "breakfast" menu is rounded out by a few coffee cakes and quickbreads. The coffee cakes were turned into mini loafs, rather than slices, as part of the La Boulange re-vamp, which apparently has outraged fans of the old style. The quickbreads, pumpkin or banana, remain slices. "A gently spiced bread with pumpkin flavors and pepitas." I am never a fan of quickbreads, no mater where from, but Starbucks had samples out, trying to entice customers to give the new La Boulange items a chance. Of course I had to try. It was just a basic pumpkin bread, with crushed pumpkin seeds on the crust. The pumpkin flavor was not very strong. It was pretty dry. It was however, very spiced. Too spiced. Too much nutmeg perhaps? I did not like, and would never purchase. And finally, my favorite category: desserts! Not that Starbucks has a lot to offer here, just a couple cookies, a rice crispie treat, and pound cake. Then again, I consider a majority of their "drinks" desserts anyway, so it isn't like it is hard to satisfy your sweet tooth at Starbucks. Sometime in the past year or so, I had a cake pop that I really loved. But for the life of me, I can't remember where it was from. The most cake pops I've had have been from Sweet Lauren, but I haven't ever really liked those. I really want to like cake pops though, as eating desserts on sticks just seems way too fun. Let me know if you have recommendations for any! Anyway, while I did research on Starbucks baked goods selection, I kept finding mentions of their cake pops. People seemed to legitimately like them, which is more than I can say for most of their other food offerings. In particularly people mentioned the chocolate ones, but I haven't been able to find those anywhere. 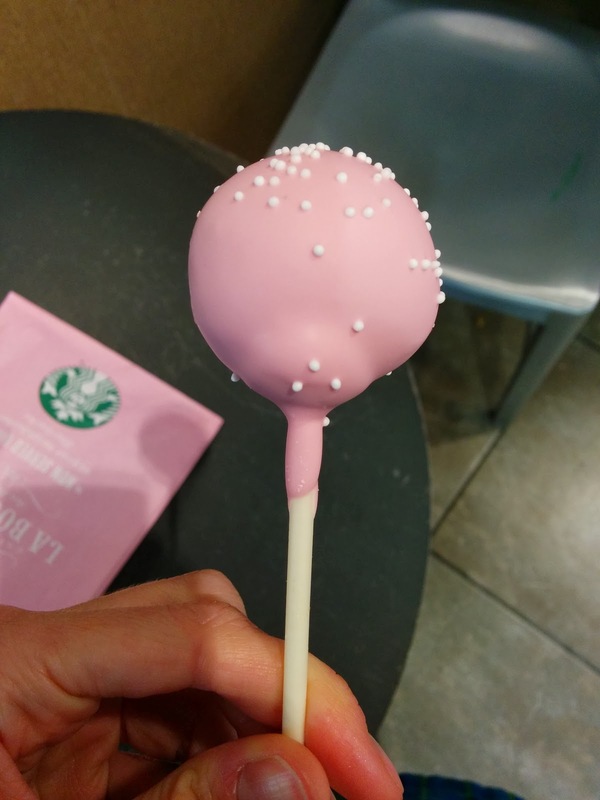 So I went for the one I could find, the "Birthday Cake Pop", described as "vanilla cake and icing, dipped in a pink chocolaty coating with white sprinkles." It was a pretty standard cake pop. The pink colored white chocolate shell was far too thick, resulting in one-note sweetness. A little of this would have gone a long way, and it was exactly the type of white chocolate that gives white chocolate a bad rep, just so, so sweet. I liked the crunch from the sprinkles it was dipped in, and wished there were more of them. Inside was the cake, in classic cake-pop form, it had the icing mixed into the cake, creating a very dense, moist interior. It wasn't particularly vanilla flavored. So overall, not a winner, and far too sweet. It would have probably paired nicely with a strong, bitter black coffee, but that isn't exactly what Starbucks is known for either. If they added some actual vanilla flavor to the cake, thinned out the shell layer, and dunked it in more sprinkles, perhaps it would be a decent pick. The idea is right, the execution just wasn't stellar. $1.50 price was fine for the small treat. Starbucks doesn't offer these anymore, but I tried one at some point. I'm really not sure why. This was totally unremarkable, although, I'm not sure what would make a good madeleine, they just aren't interesting in general. It was fairly flavorless. Kinda oily. Obviously baked a long time ago, individually wrapped to last a while. Meh.